This morning we walked out to the beach and saw the large amount of land that was exposed at low tide. I thought this would be a good place to hunt for sea critters. This sea star looking creature that Zoe found was actually a banded-arm brittle star (Ophioderma appressum). I did not know that these were even a thing. The most prevalent animal around were the crabs. The smallest ones on the beach seemed like ants until you looked closer. This one was my favorite. We debated if it was just a furry species or if some sort of seaweed was growing on it. We had a nice lunch at one of the First Landing Beach Resort's restaurants. I got this excellent whole fried fish with a sweet and spicy glaze on it. I was eating as fast as I could. In a classic fashion the hotel kitchen seemed to be on Fiji Time but our tour operator was very much on business time. One of them walked right up to our table while we were eating and told us it was time to leave. Whatever dude. Lydia got some more local root vegetables in french fry form. They were really good. Our first stop was the Sri Siva Subramaniya Hindu Temple. There's a large Indian population in Fiji that was imported to the area by the British. Lydia and I both rolled our eyes when we learned this fact as it is pretty much the same story as Trinidad and Tobago which we left like 1.5 weeks ago. There were a lot of rules. Our sinful, sinful legs were uncovered so they lent us some cloth to wrap around them. You'd think a god with an elephant head would be a little bit more lenient about people's bodies, but what can you do? Rules rules. I believe the "grog" referenced means the kava root drink from last night. We did some fun city driving on our way to a tourist trap souvenir shop. It was one of those places where a lady will follow you around the whole time you are there. I didn't like the atmosphere and I didn't buy anything but it was fun to look around. They had chocolate with kava in it, but now that I knew the massive amount of kava you need to ingest I figured it was just a gimmick. I was maybe most excited about going to a local farmer's market. There was a man selling kava root. I heard that the good stuff is multiple years old, so maybe the reason our stuff has been so weak is it has been the young cheap stuff? When we were done drinking our coconut waters we took them back to the man who sold them to us and he cracked them open so we could eat the meat. It was really wet and slimey, since the young coconuts are the ones that you drink from. The next stop was the Garden of the Sleeping Giant. I don't know if you can tell from this picture but there's a mountain that looks like a giant is laying down, with different peaks looking like a nose or knees or whatever. Funny story, on our initial drive from the airport to the hotel our cab driver pointed out the Sleeping Giant Mountain. Again this was sort of an eye roll because Costa Rica has a similar thing that they call the Sleeping Indian Mountain. I told our driver, who was of India-Indian descent, and he seemed really confused. So I, being the amateur US ambassador that I am, explained that when Christopher Columbus arrived in the New World he thought he'd landed in India and so referred to the locals as Indians. We never corrected ourselves and now we have two groups that we call the same name because apparently we hate clarity. He thought that was really funny. Louis C.K. does a bit on the subject that is pretty good. So we did some strolling through the Garden of the Sleeping Giant. This is a baby pineapple. Pineapples were a fruit that I couldn't really visualize how they grew until I saw it for myself. I think I thought they must be connected to trees somehow. There were orchids left and right. There were pink bananas which are apparently edible. I really really want to try one. On the way to our next destination we passed a couple boys playing with an old tire. Our driver and guide stopped the van and chatted with them a little. They said if we wanted the tire it would be $5. We politely declined. Our last stop was Sabeto Hot Springs and Mud Pool. The idea was: put mud on yourself, let it dry, then soak it off in a geothermal pool. We sat in this mud bog for a while and with the nearby cattle mooing I couldn't help but think about how much of the sludge we were steeping ourselves in came from those cows. 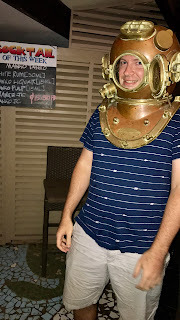 In the hotel bar there was a U.S. Navy Mark V Diving Helmet from the 40's. I went over to admire it and take a couple pictures and the bartender asked if I wanted to try it on. Yes, yes I did. It was pretty claustrophobic in there. It was fun to play with but I was definitely relieved when it was off of my head. The hotel had different little cultural things every night and tonight it was: kava ceremony! Why not? Api the kava man even let us make a fresh batch. It really had a dirty dishwater look and taste to it. Bottoms up!